During my childhood years, there were many practices that were religiously followed at home. As we grew up, moved places, these rituals kept evolving and eventually there were a few such rituals which stood the test of time. One such ritual was that of an evening snack called Ghugni. It is a ritual which is still in place and practiced at least once a week in my parents home. You may find it strange that I call this Ghugni and the picture shows dried black chickpeas. This is Ghugni as it is known in Bihar. It is different from the Ghugni I have posted previously. The previous one is made using dried peas with tamarind as the souring agent. 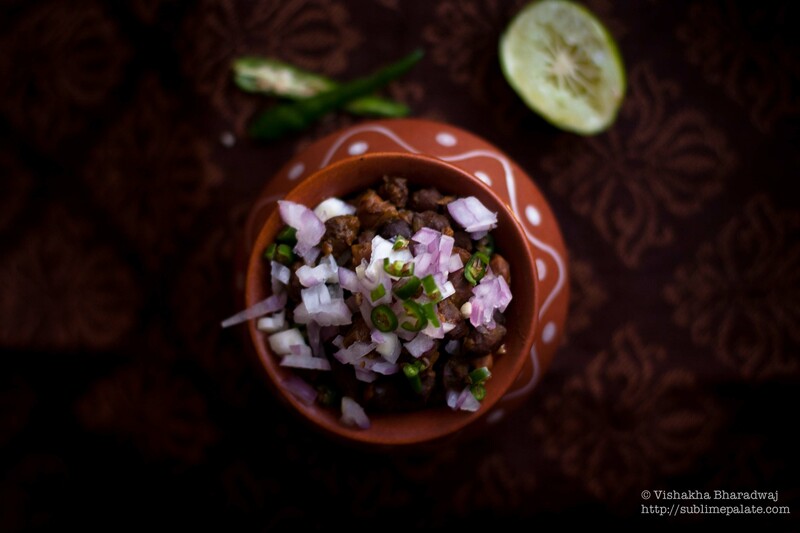 This one is made using dried Black Chickpeas or Sookha Kaala Chana, simply known as kaala chana. Besides using different key ingredients, the two ghugnis are meant for the same purpose: snack / street food. However, they differ in their taste, texture as well as method of preparation. Ma prepares for this Ghugni the night before. She soaks a generous amount of the Kaala Chana in water. The next morning she pressure cooks these soaked dried chickpeas with some salt. These cooked chickpeas are then ready to be cooked in some spices to make it into what is known in Bihar as “Ghugni”. This version of ghugni is usually had with some “chooda ka bhuja” or roasted/fried and spiced flattened rice (poha / chooda / chidva). 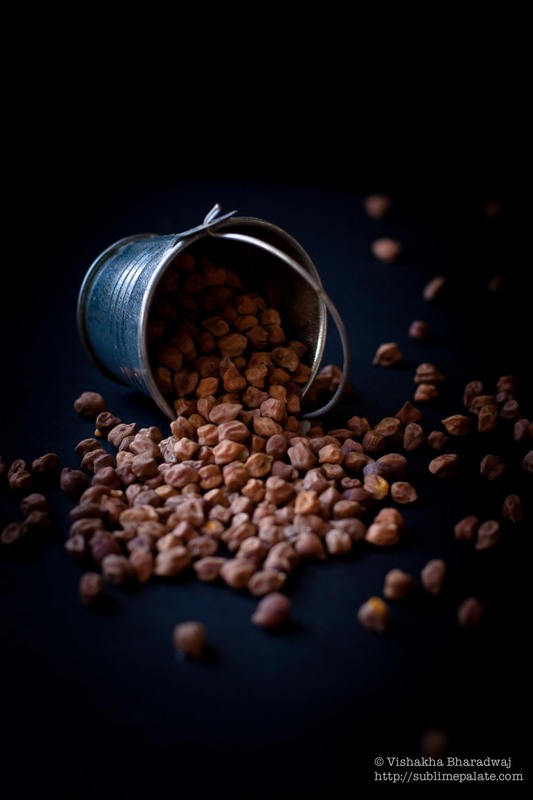 The good news is that Kala Chana has a number of health benefits. They are high in dietary fibre. They serve as a good source of proteins for vegetarians. Therefore, this is one of those snacks where you can eat as much, almost guilt free. I find the Ghugni self sufficient as a snack. It definitely tastes much better the following day as the spices get sufficient time to infuse their flavours with the cooked chickpeas. It becomes a little dry with time so before serving, you will need to add some warm water and adjust the seasoning in order to suit your taste. Bihari Ghugni Recipe: To print the recipe, click here. Cooking time: Up to 1.5 hours including boiling the chickpeas. A healthy vegetarian snack though it does require a little bit of advance planning. Dried red chilli: 1-2 (as per your tolerance). Lime: 1-2, cut anyway to squeeze the juice on the cooked ghugni. Wash and soak the Sookha Kaala Chana overnight or for about 8 hours in water. Wash it again. In a pressure cooker, add the Kaala chana, sufficient water making to cover the chickpeas as well as extra to make sure there is enough room for the chickpeas to expand in volume, a pinch of salt & a slice of ginger. Start the pressure cooker on high heat. After the steam builds up [first whistle], lower the heat to cook for another 15 mins. If using an open pot, make sure the chickpeas are cooked through – You should be able to crush them if you press them between two fingers. They should retain their shape and not be mushy at all. Allow the steam to release on it’s own. Discard the slice of ginger. Strain the mix, reserving the liquid for cooking. In a deep bottomed pot or a wok / Kadhai, heat 1 tbsp mustard oil. Bring it to a smoking point, and then let it cool down. If using regular oil, simply heat the oil and move on to the next additions. Add cumin seeds, dry red chilli, cinnamon stick and bay leaf. Let the aroma release in the oil. Reduce heat if necessary, making sure the spices do not burn. Next, add the finely chopped ginger and garlic. Fry for about 2 mins on low heat. Add the finely chopped onions and a pinch of salt to season the masala. Fry on low-medium heat stirring continuously for about 7-8 mins until almost done. 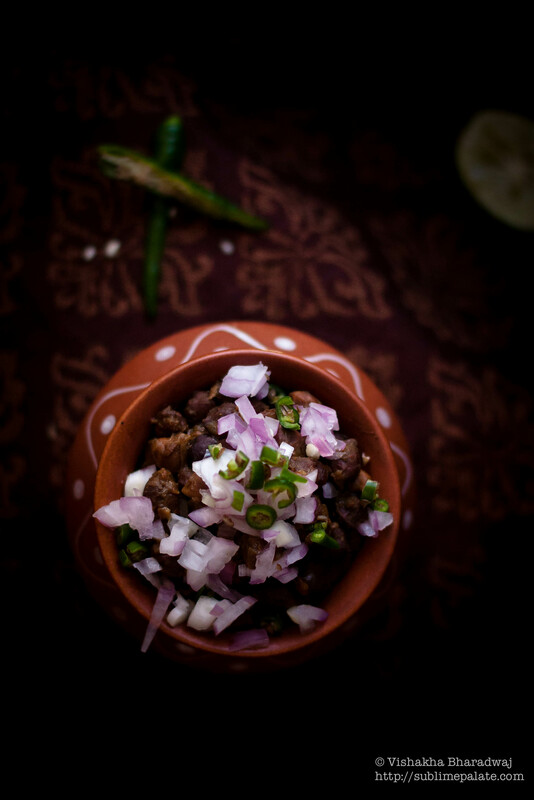 This is also called bhuno, a term used in Indian cooking which means to cook the spices slowly to ensure the maximum flavours are released and the raw smell from the spices and ingredients no longer exists. Doing this step right is essential to maximise the flavour of any dish. While the onions are frying, mix together all the ingredients listed under ‘Spice Mix’ and add next. Continue to cook the masala for another 2-3 mins until there is no raw smell of any masala. Increase heat to high and continue to stir making sure the masala sticks to the kaala chana. Keep adding 2-3 ladles of the reserved boiling liquid and continue cooking on low-medium heat until the liquid is absorbed by the Chana. The liquid additions should be enough to make sure the Chana has some extra liquid. 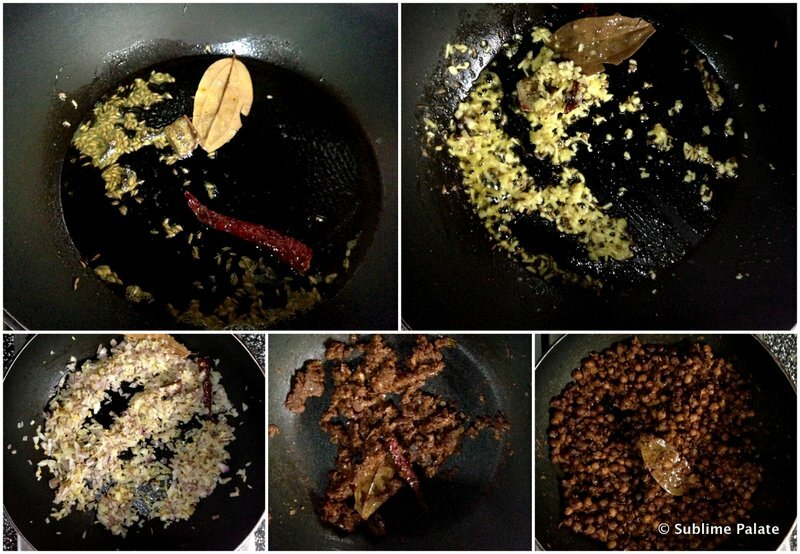 The idea is to slowly infuse all the flavour from the liquid into the Chana while cooking the spices. Repeat this process until all or most of the liquid is used up. Remember that the cooking liquid already contains salt. Taste often to adjust the salt if needed. 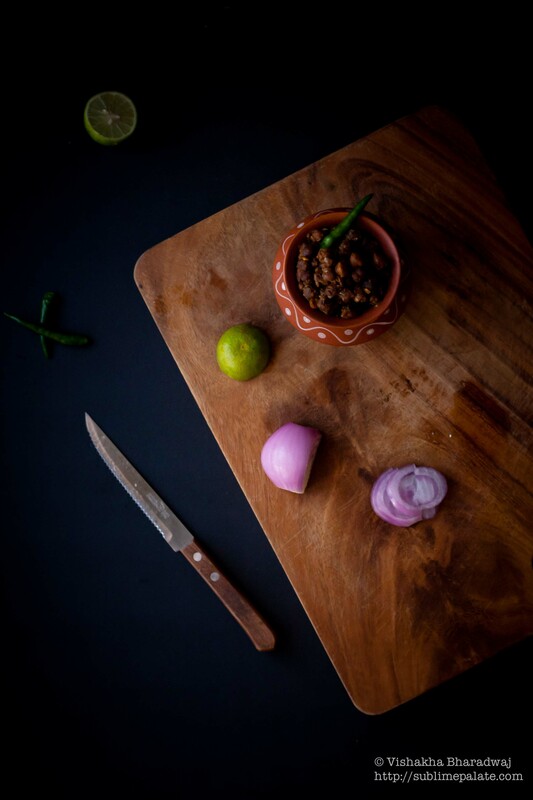 If serving later, heat up the chana, adding a little water to make it moist. We don’t want this to be too dry. If adding water, adjust the level of salt. 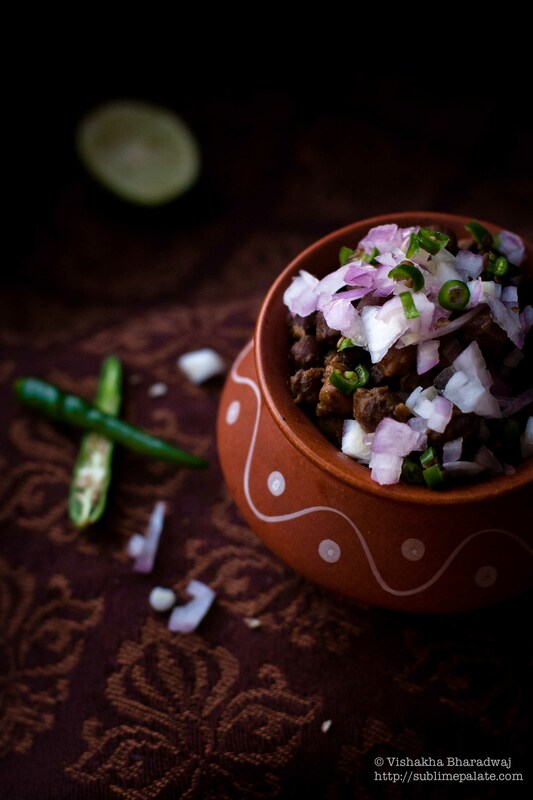 Serve in bowls or a plate, garnished with chopped onions, green chillies and lime. 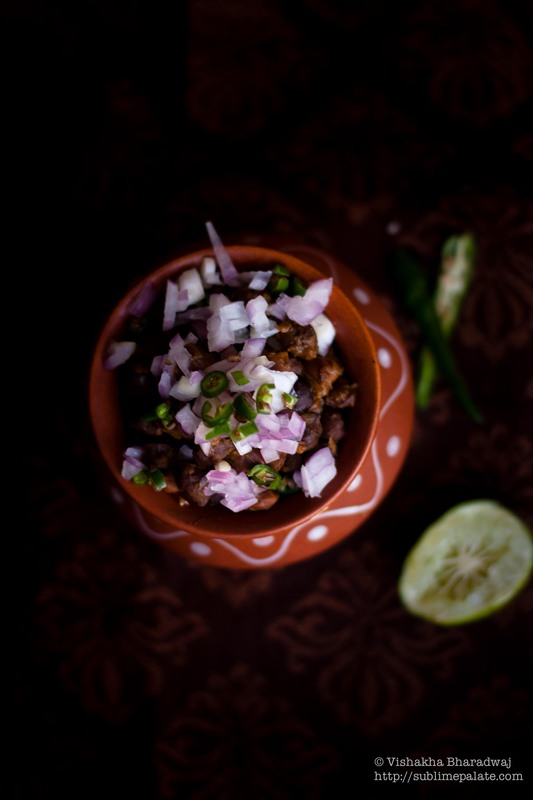 Traditionally, this is served with chooda ka bhooja or lightly spiced and roasted beaten rice. I find this tastes great on it’s own too. Chop the ingredients for garnishing just before serving. The freshness of the onions, green chilli and lime will elevate your snack to another level. I spend a lot of time cooking this ghugni slowly. It helps to infuse flavours to these chickpeas and I find it totally worth the time and effort. Sublime Palate Blog at WordPress.com.